Benny Feilhaber was a standout midfielder for Northwood High School in Irvine, after which, as a walk-on, he became a mainstay in the UCLA midfield. 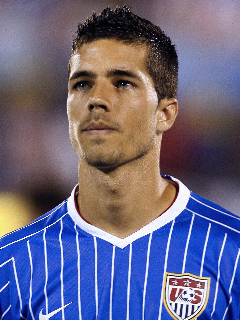 Following his second year at UCLA, Feilhaber was called up by the U.S. U-20 national soccer team to play in the 2005 FIFA World Youth Championship in The Netherlands. Feilhaber made his first career start for the U.S. National Team in March 2007, was a member of the U.S. Under-23 team that competed at the 2008 Olympics, and played for the U.S. at the 2009 FIFA Confederations Cup. Benny was a breakout soccer star at the Youth World Cup in 2004. The Brazilian-born midfielder represented the U.S. at the 2005 Maccabiah Games in Israel, after which he signed with Hamburg in the German Bundesliga. For 2007-08, he played for Derby County in the Premier League. And since 2008, he has been with AGF Aarhus in the Danish Superliga. At UCLA, Benny was an Academic All-American and, as an engineering major, had one of the highest GPA's among all Bruin athletes.